Neymar limped out of training on Tuesday, sparking fears he could miss Brazil’s second Group E game against Costa Rica on Friday. "As soon as he felt the pain he went to the physio," said Brazil spokesman Vinicius Rodrigues. "He will stay there for today and tomorrow morning, and will train as normal tomorrow." Neymar returned from a broken metatarsal injury suffered in February shortly before the tournament, scoring in warm-up games against Croatia and Austria. 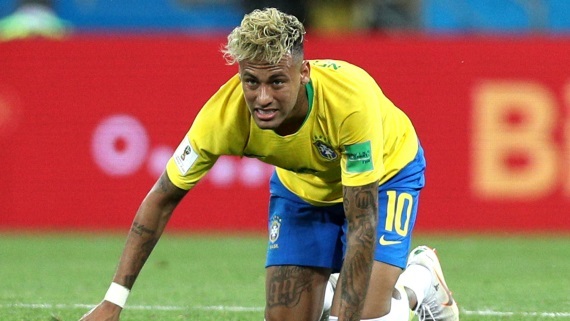 He played the full 90 minutes of Brazil's 1-1 draw with Switzerland, a game in which he became the most fouled player at the World Cup in the last 20 years, but missed training on Monday. The injury has left Brazil fans fearing a repeat of the 2014 World Cup, where Neymar’s tournament was ended when he suffered a back injury in the quarter-final win over Colombia.